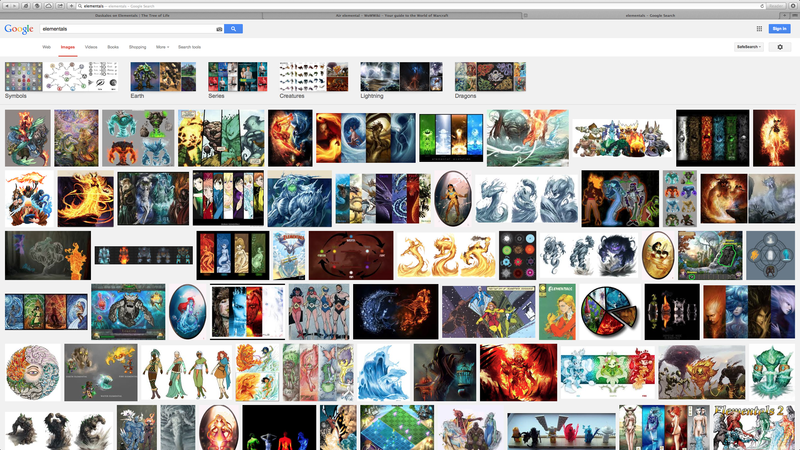 Categories and images on Google when you use the search word ‘Elementals’. Colourful and diverse, aren’t they! These categories correspond to the ‘Classical’ (Greek) elements of earth, water, air and fire. Aether, the fifth element, was not assigned an elemental in Paracelsus’s scheme. The Classical elements were highly influential in Medieval natural philosophy, and it appears that Paracelsus intended to draw a range of mythological beings into this model by assigning them to one of these four elemental types. In turn, the Paracelsian concept of Elementals drew from several much older traditions in mythology and religion. Fast forward a few hundred years. 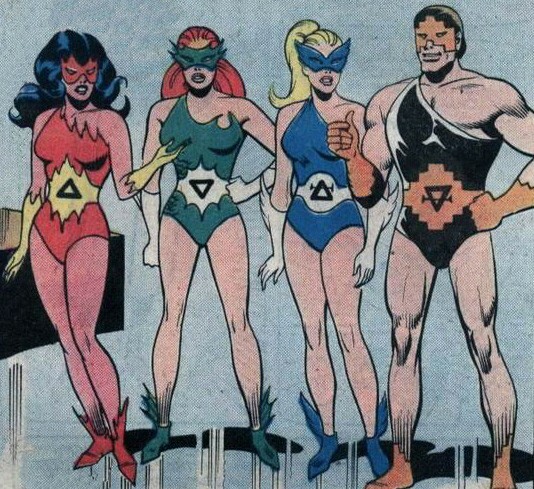 In the late 1970’s these four elementals first appeared as superheroes in the DC Comic Super Friends #14. The characters were created by E. Nelson Bridwell and Ramona Fradon and had wonderful costumes and hair. For those in the know, the symbols on their belts are the alchemical symbols of fire (up), water (down), air and earth. The Elementals, from left to right, Salamander, Undine, Sylph and Gnome. The symbols on their belts represent the alchemical symbols for fire, water, air and earth. Art by Ramona Fradon. Source: Wikipedia. The appeal of Elementals in popular culture continues today. As one of many examples, in the last two or so years Brigid Kemmerer has written eight books in the ‘Elemental’ series, aimed at Young Adults. The titles of the books include ‘Elemental’, ‘Breathless’, ‘Spark’, ‘Storm’ and ‘Spirit’ (unlike Paracelsus, Brigid does embrace the fifth element). The main characters, who are teenagers, have elemental powers that can get out of control. Romance is also part of the mix, as you might expect. Based on the reviews, people seem to enjoy the story-line and come back for more. 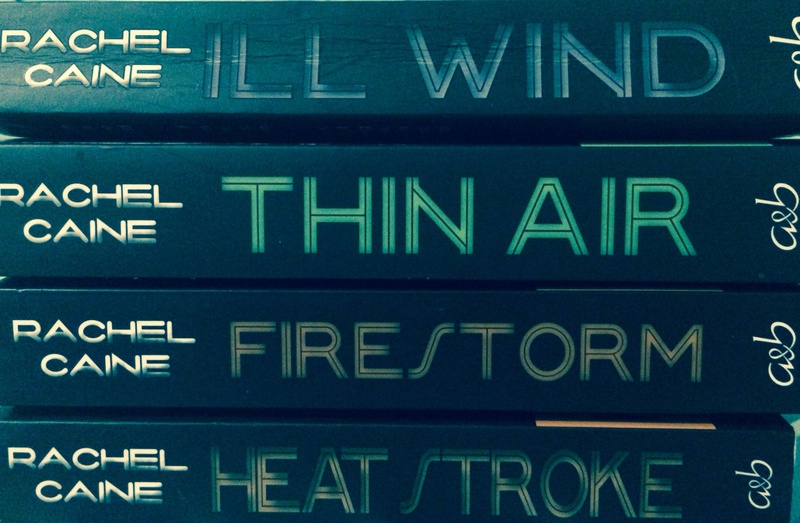 A selection of titles from the Weather Warden series by Rachel Caine. The Wardens protect humanity from Mother Nature using their powers over the elements. The story goes that Mother Nature is not happy with the way humans are treating her and without the Wardens the earthquakes/tornadoes/floods/other assorted (so-called) natural disasters we currently suffer would be much worse. So much worse in fact that humanity could be wiped out. This is a story of our time. Joannes’s elemental gift is over water and air. She can summon up a storm and divert a disaster, but whenever a Warden uses their power, the energy fallout has to go somewhere. The challenge is to expel the energy without creating another disaster along the way. There’s energy again – it often crops up in relation to the elements. “The elementals are potent and volatile elemental spirits of pure elemental energies (my under-lining) and were once the minions of the Old Gods (and some may still be). Many are commanded by the most powerful elemental lieutenants called the Elemental Lords – Ragnaros the Firelord, Therazane the Stonemother, Al’Akir the Windlord and Neptulon the Tidehunter — whilst others are commanded by primordial elementals known as Elemental Spirits”. It sounds like an incredible fantasy world for people to explore. There are also on-line games such as ‘Elementals: The Magic Key’ which appear to be targeted at a younger audience, or at least at an audience that likes different graphics than the WoW. Captain Planet and the Planeteers could also be viewed as Elementals in that they each wield the power of an element, or the elements combined in the case of the Captain. What is it about elementals that is so appealing and long-lasting I wonder? They certainly provide food for thought. Elementals have also been addressed outside the realm of pop culture. Authors who have been attracted to the concept include Rudolph Steiner and the Greek mystic Daskalos. Their writings on elementals can be pretty heady material and has already been covered in depth, especially for Steiner in the blog ‘The Tree of Life’. One day I’ll explore the elemental writings of Steiner, and others like him, in more detail. Not today though. Like many topics related to the intuitive elements, this post is only an introduction. There are bound to be more references to elementals in popular, and not so popular, culture to discover and share. I haven’t even touched on the Wicca and Witchcraft world of elementals for example. That’s for another post. And I’m still working out the appropriate place to use a capital E or lower case e when referring to Elementals! Some writers use capitals and others don’t, so I’ve tried to reflect these different usages. I’m keen to hear from readers about any new elemental/Elemental sightings to add to this initial and intriguing list. This entry was posted in Aether/Space, Air, Alchemy, Earth, Europe, Fire, Magic, Popular culture, Story telling, USA, Water and tagged Air, Alchemy, Captain Planet, earth, Elementals, Fire, Magic, Paracelsus, Steiner, the elements, Water, Weather Warden. Bookmark the permalink. I like the sound of Rachel Caine’s novels – as you have noted here, they are a story of our time. The idea of wardens protecting human beings from the wrath of ‘mother nature’ is intriguing. We sure need something to protect us! Also, the creation of the many fantasy worlds in the more contemporaries novels and games etc. provides a link for us with the old mythologies and that feels right. Thanks again! The Weather Wardens are appealing, I agree. As with a few of the books I’ve featured, I came across Rachel Caine in an op-shop (thrift shop). Now I’ve found another three books in the series in other op-shops. It’s a great way to do research!